Gear restrictions were officially lifted on the Chetco and Winchuck Rivers last Tuesday, when an onslaught of back-to-back low-pressure systems in southern Oregon and northern California created numerous freshets, raising the streams and allowing stranded salmon and steelhead to escape upriver. It also beckoned late fall Chinook and early winter steelhead to enter the river as well. 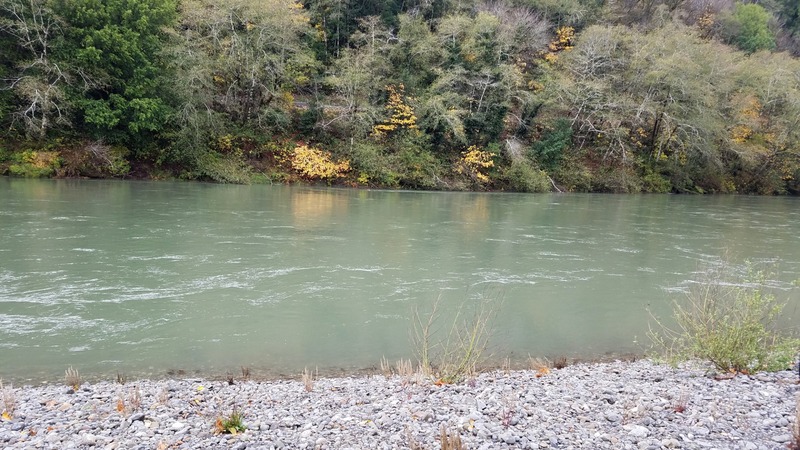 “We are back on track with water flows in the Chetco and Winchuck, and fall Chinook are now moving upriver,” said ODFW district fisheries biologist Steve Mazur. The week before last, the Chetco was too high for anglers to effectively fish, because of strong river flows causing the river to blow out to an unfishable chocolate-brown hue. But last Thursday, the Chetco dropped to 3,500 cubic feet per second, accompanied by a light velvety Irish-green coloration. Perfection visibility was in the 4- to 10-inch range, allowing anglers to deploy a variety of side-drifting, drift-fishing and plunking techniques. And although the water conditions were more than ideal throughout the entire Chetco system from Social Security Bar up to the South Fork, biting salmonids were few and far between, and the fishing was considered slow at best. But that’s not untypical for the first part of December, when fall Chinook are heavy into the spawning procedure and winter steelhead are just beginning to enter the river. Now that it is December 1, anglers can look forward to the fishing getting better and better each day. Remember that January and February are the peak season months for winter steelhead on the Chetco. I would even hazard a guess that the first big storm during the Christmas holiday usually ushers in the first large batches of winter steelhead to both the Chetco and Rogue River systems. But in the meantime, there will still be steelhead ready to be caught. An anglers just needs to make more casts and cover more water in order to get bit. After all, steelhead didn’t earn the phrase, “fish of a thousand casts” for nothing. Just think of salmon and steelhead fishing in terms of being on the same bell curve, and the way that a bell is shaped describes the beginning and ending of the salmon and steelhead run to a tee. The shape of a bell starts and ends in exactly the same way. At the beginning and end of the bell curve, there are less biting fish. You could think of the end of the bell curve as the end of the salmon run. Although there are more salmon on the spawning beds, there are less fish entering the river. By the same token, you can also think of the beginning of the bell curve as being the beginning of the winter steelhead run, with winter steelhead begin trickling into the Chetco River during the month of November. As mid-December rolls around, the bell begins to steepen and the steelhead runs start increasing. By January, you’ve reached the top, center of the bell curve, and the steelhead run is at its apex. February steelhead action would take place from the center of the bell curve toward the beginning of the slope on the downside of the curve. There are still a lot of fish left to be caught in February near the apex of the bell, but they’re numbers are also starting to diminish as the round the downward side of the bell. As the beginning of March, the bulk of the fish could be imagined as being on the downward side of the bell curve toward the middle of the slope. By the end of March and the beginning of April, the steelhead run can be imagined being on the downward side of the slope until the bell curve finally levels off toward the end of April. Now, what techniques should anglers deploy on winter steelhead in the months to come? Well, first there’s the color wheel, with the mild misty green color always being the best color, especially when a river like the Chetco is dropping and clearing. The Chetco on-the-drop has always been the best time to fish the river. A river on-the-drop, and is accompanied with a velvety Irish green hue, is a steelhead just waiting for an angler to happen, especially when deploying various techniques. When the Chetco is between 2,000 and 2,800 cfs and possesses the aforementioned coloration, drift-fishing Puff Balls-and-roe, yarnballs, or Corkies, seems to be the best techniques for bank fishermen. It is also a killer flow for anglers side-drifting the same aforementioned setups from a boat, or for anglers pulling plugs from a boat as well. Between 2,800 and 4,000 cfs, and with ideal coloration, side-drifting single beads, single Corkies and Puff Balls with a smidgeon of one or two eggs from a boat seems to be techniques that rule the river. It is also a great condition for pulling plugs like Brad’s Wigglers and Wee Wigglers, or 3.5-inch Mag Lips. Note that you do not have to wrap steelhead plugs like people do when the pull plugs for salmon. Now as 4,000 cfs or higher flows start becoming more common, plunking is the technique that rules the river. And at these higher flows, plunkers will practically own the river, because there will be virtually no drift boats floating the river at all. Great plunking rigs are Spin-N-Glows attached to an 8-ounce sinker. The top three best Spin-N-Glow plunking colors are 1. Flame Chartreuse with white wings, 2. Egg Fluorescent with white wings, 3. Sherbet with black wings, 4. Rocket Red Tiger Stripe with white wings, and lastly 5. Pink Pearl with white wings. If you’re on a budget, just buy size 4 and 6 Spin-N-Glos. Any of these five colors will definitely put the odds in your favor of having your rod double over. Also, if you’re plunking, you are also going to need a good rod holder. I make mine out of a construction spike duct taped to a piece of PVC. Hammer the holder into the ground with a hammer or mini sledge, put your rod in the holder, put the clicker on your reel, and wait for the line to scream out as the streamlined locomotive hammers your offering on its way up the tracks to its native spawning grounds. Just remember not to get discouraged when you are fishing for steelhead this time of the year. Patience is the name of the game and the fishing will improve as it approaches mid-December to January. Also remember that as of the first of the year, anglers are only allowed to keep 1 wild fish per day; 3 for the entire season. Anglers can still keep 2 hatchery steelhead a day, so I heartily recommend buying hatchery harvest cards for this purpose. On super-flat days in between storms, anglers are still catching limits of rockfish and lings.